Of course Tehachapi is a safe city, but Chief Kent Kroeger of the police department and Mayor Susan Wiggins shouldn't ingratiate themselves, and take credit for making Tehachapi safe. 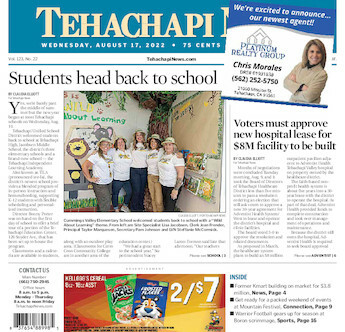 I read years ago in the Los Angeles Times that Tehachapi was the safest place in all of California, and not just in Kern County. Why can't people tell the real story as to why Tehachapi is safe? Study the demographics and census statistics and the answer is pretty clear. If you can afford it, people who want to be even safer live inside walled compounds or gated communities like Bear Valley Springs. Seldom do police actually stop crime from happening but they do investigate, and once in a while lock up the bad guys. Having a police department in town is in itself a deterrent to crime, but that quasi protection doesn't come cheap. I wonder what the price tag for that new asphalt parking lot at the police station is costing the people of Tehachapi, or did they get some grant from us taxpayers? I doubt if most residents in town will ever set foot in that new parking lot, but in the meantime everyone uses the roads around town and they are in dismal shape. Go figure!